Place dry ingredients in coffee mug or two cup measuring cup and mix well. Pour in milk and oil. Mix well. Add vanilla and any optional extras and mix again. Put mug in microwave and cook for 3 minutes at 1000 watts. Cake may rise over the top of your mug but that’s ok. In fact it’s great. Kudos to you! Remove the cake from the mug, slice it in half and ice each half with GF icing if desired. Also goes well with Chapman’s GF vanilla ice cream. TIP: This cake doesn’t keep well, so you have an excuse to eat the whole thing right away. However, if you have the will power and want to save some for tomorrow, the best thing to do is to wrap the leftover cake in tinfoil (remove any icing) and plump it in a 350° oven for 5 to 10 minutes before serving. Like this? You might also like our decadent dark chocolate cake or our sinful chocolate mousse cake. Make any of these even more decadent with a scoop of vanilla or coffee flavoured ice cream! This entry was posted in Baking, Drinks & Desserts, Recipes and tagged Cake, cake-in-a-mug, Cupcake, GF, gf cake-in-a-mug, gluten free, gluten free cake-in-a-mug, gluten free snack. Bookmark the permalink. Thank you for the like! 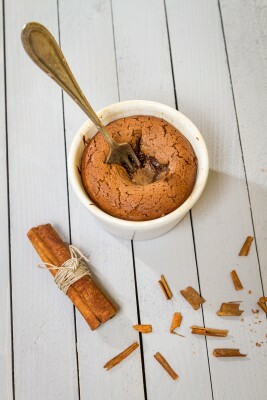 I’m so glad to have found you…gluten-free cake in a mug?! Seriously…you had me at microwave! I can’t wait to see what you bake up next! Thanks for coming by! The cake in a mug is great but you do need to eat it fairly quickly or it goes quite hard. The sinful chocolate mousse cake is awesome too. I keep thinking I should adjust the ingredients to make a single serving version. Sometimes you just don’t need an entire cake!